The summer heat can be dangerous for seniors. Seniors are at a greater risk for heat-related illnesses like heat stroke and heat exhaustion. This is because their bodies aren’t able to adjust to heat as well as those of younger people. They also may have medical conditions or take medications that change the way their bodies react to higher temperatures. Sometimes the higher temperatures can make it difficult for family members and elder care providers to find things to do with seniors during the summer while still staying cool. 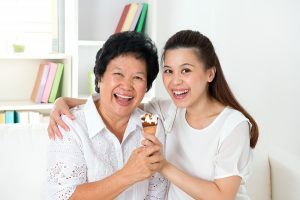 To help keep your senior parent active and connected this summer, here are five activities for seniors to participate in with family members and elder care providers. Your parent probably remembers drive-in movies, so why not take them back by showing a movie outside at night. If you wait until dusk, the heat will be past its peak and the temperatures will be a little cooler. Project the movie on the side of your house or on the garage door for a more authentic feel. To keep your parent even cooler, make a pitcher of ice cold lemonade to enjoy while you watch. 2. Make Homemade Ice Cream. Cold, creamy ice cream tastes great on a hot day. It’s even better (and more fun!) when the ice cream is homemade. Let your parent help by adding ingredients and turning the crank on the ice cream maker. Your local library may have a summer reading program for adults, but if they don’t, why not start up one of your own with your parent? Choose books to read together and discuss. If your parent has difficulty reading on their own because of poor vision or other problems, read aloud to them or ask their elder care provider to spend some time reading to them. Evidence suggests that lifelong learning can help prevent cognitive decline, so why not learn something new with your parent this summer? Look for classes offered through a local community college or other organization. Or, simply decide on something the two of you want to learn and take advantage of resources from the library and the Internet. 5. Start a New Tradition. Help your parent stay connected with the rest of the family by starting up a new summer tradition, such as Sunday dinners with the whole family, family game nights, or family movie nights. The events don’t have to be elaborate. Just ask family members to bring a dish to pass, a favorite game, or a good movie, then gather and enjoy spending time as a family. If you or an aging loved one are considering elder care in Colts Neck, NJ, please contact the caring staff at Lares Home Care 888-492-3538 or 732-566-1112.